Owakudani (大涌谷), which means the "Great Boiling valley," has an altitude of 1,040 metres and was formed around 3,000 years ago following a large eruption of Mount Hakone. Owakudani is a volcanic crater or caldera located on the northern side of Mount Kamiyama which is itself part of the larger Hakone volcano. Hard to access by car. Owakudani, which means the "Great Boiling valley," has an altitude of 1,040 metres and was formed around 3,000 years ago following a large eruption of Mount Hakone. Owakudani is a volcanic crater or caldera located on the northern side of Mount Kamiyama which is itself part of the larger Hakone volcano. The valley itself is a part of the larger Hakone mountain range which was at one time an enormous volcano which, after two large scale eruptions, collapsed in on itself forming two large caldera. The western caldera lake is the large Lake Ashi which formed around 60,000 years ago. The Kamiyama and Komagatake mountains are in fact volcanic plugs that developed at the centre of the large Hakone volcano's caldera. Owakudani is one of those few places where one can feel the Earth breath and experience an entirely new dimension to life on this wonderful planet. There are many boiling pools of sulphur rich mineral water and huge vents spew forth volcanic fumes of hydrogen sulphide and sulphur dioxide. The entire area has a strong smell of rotten eggs and at times it can be hazardous to those with weak lungs. 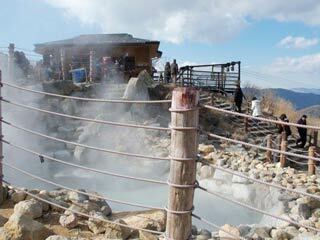 At Owakudani one can enjoy "kuro tamago" or black eggs which are eggs boiled in the hot 100 ℃ natural spring waters. The black eggs are famous throughout Hakone and there are also many souvenirs associated with the famous kuro tamago.